Did You Know Michael Rapaport Has a Podcast? 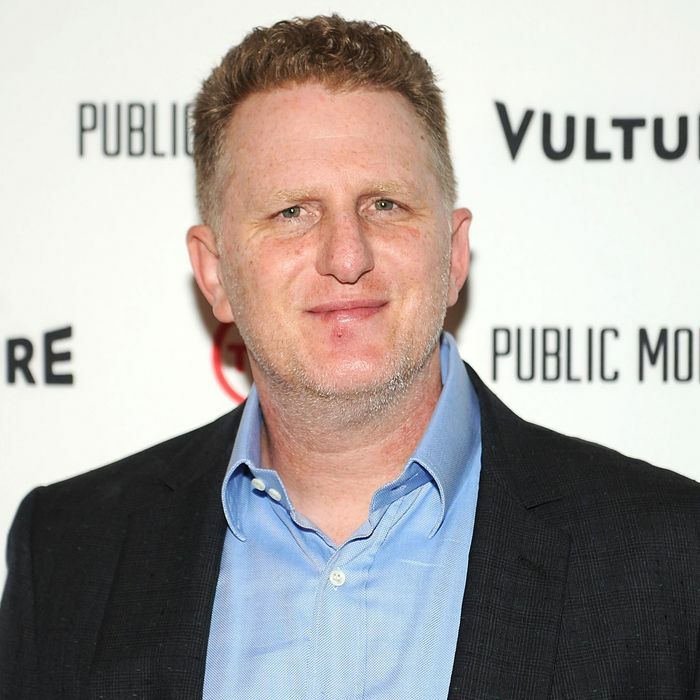 Did you know that Michael Rapaport — an actor and filmmaker who has appeared in Justified, Hitch, and True Romance — has a podcast? Twenty-four hours ago, I did not. Now I do. This is the story of how I found out. I’m no stranger to the weird in-jokes that arise from the intense bond between podcasters and their fans. I myself listen to a podcast devoted to a terrible basketball team, one which requires me to say the phrase, “Yeah, you know Lickface,” when asked. (Don’t ask.) Still, I was adrift. It was not immediately clear whether this was a podcast run by the Michael Rapaport, a diligent Michael Rapaport fan, or simply a regular guy who happened to be named Michael Rapaport. (According to the United States Census Bureau, in 2000 there were 801 people in the country with the last name “Rapaport,” exactly as many as “DeWit,” “Philhower,” and “Shapley”; 2,804 people had “Rappaport.”) I figured I’d get him to clarify. “Are you the successful character actor Michael Rapaport?” I asked, which seemed like a fair way of putting it. This made his followers real mad. Yes, at this point I found myself in an odd place, one that I never guessed I might visit: a fairly crowded Twitter canoe with a bunch of pissed-off Michael Rapaport fans. In situations like this, I’ve found the best way to de-escalate the situation is to act like a friendly tourist lost in an unfamiliar country. So, I asked them what “talking greasy” meant. The response: “Talking sh*t. It’s Rapaspeak.” The ice was broken. Who was I talking greasy about? “It seemed maybe Michael Rappaport, a.k.a. the Gringo Mandingo a.k.a. the white Arsenio Hall,” said the friendliest of the bunch. I’ve never spoken an unkind word about Michael Rapaport in my life, I replied. (Which is true: I’ve generally enjoyed his performances when I’ve seen them, and I know absolutely nothing about his personal life.) This went over well; I even got a “Cheers!” They asked me if I had ever listened to the podcast. I had to admit that I had never heard of it until a bunch of people started tweeting at me. They were a little bit disappointed by this, but told me I should give it a listen: “It’s a worldwide phenomenon.” I went to bed, convinced we had buried the hatchet. But overnight, the truce was nearly broken. Another fan, whose handle indicated they lived in Australia, pressed on. “Nate, you spoke greasy about Leo dating models,” they said. “What’s it to you? Mind your business please.” They were right. On April 8, I had written a post about Leonardo DiCaprio possibly dating a teenage model from the Netherlands. This was apparently the origins of the dispute with the I Am Rapaport podcast and its legion of fans. I’m a blogger; I’ve written many things I can’t defend. But this post was not one of them. The headline was grabby, it had some solid jokes in it, and the report I was aggregating was not immediately disproven after I’d published. When you’re blogging news, that’s basically as good as it gets. Staring at my phone at the gym this morning, I took some time to consider my options. I settled on a polite defense. “If we can’t lightly mock Leo,” I asked, “who can we?” This seemed to do the trick. “If it was gentle, it’s all good,” my accuser wrote. Tensions between Vulture and the Rapapack had been eased. 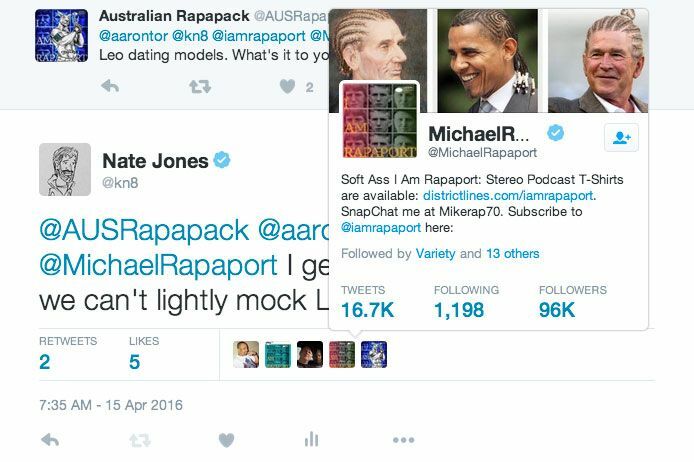 Michael Rapaport himself had been tagged in all these tweets the whole time but said nothing. Finally, a few minutes later, he weighed in — with a simple fave. But I never did figure out what “We don’t fact check” means. Postscript: I still have not listened to the I Am Rapaport podcast, but would gladly appear on it any time Michael Rapaport asked.